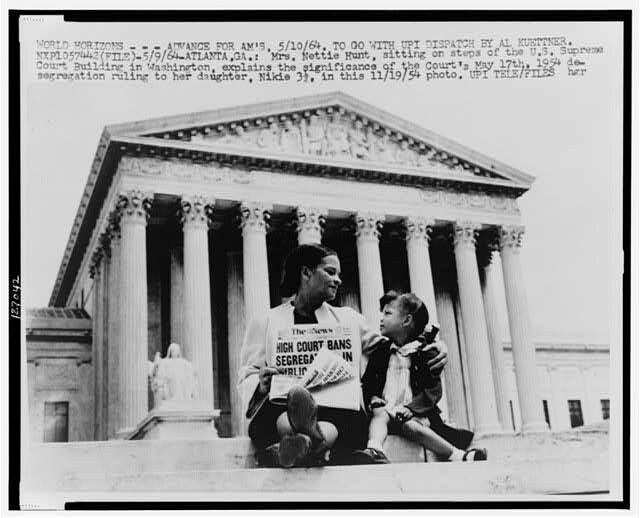 The Supreme Court's decision on the Brown v. Board of Education case in 1954 marked a culmination in the NAACP's plan to end segregation in schools. African-American parents throughout the country like Mrs. Hunt, shown here, explained to their children why this was an important moment in history. 1. What is Mrs. Hunt holding? 2. What building are Mrs. Hunt and her daughter sitting in front of? How does this add to the impact of the photo? 3. The child in the photo was only three years old at the time. How might Mrs. Hunt have felt when she explained the court ruling to her daughter? * The photo on this screen has a resolution of 72 dots per inch (dpi), and therefore will print poorly. You can obtain a larger version of Photo 6 , but be aware that the file will take as much as 35 seconds to load with a 28.8K modem.